Around 17- to 25-years-old, our third and final set of teeth erupt: our wisdom teeth. Unlike our primary and permanent teeth, this last set of molars do not form in the womb. When the wisdom tooth fails to erupt entirely, it can lead to pericoronitis. Pericoronitis is an oral health problem that often affects the third set of molars or wisdom teeth. Also, colloquially referred to as “wisdom tooth infection,” pericoronitis is the inflammation of the soft tissues around the crown area of a partially-erupted tooth where the gingival tissue overlays the chewing surface of the tooth. The dental problem can either be persistent or severe. What are the different types of pericoronitis? 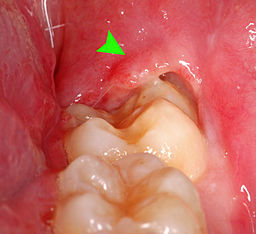 Chronic pericoronitis is a mild inflammation of the infected area with little to no symptoms. On the other hand, acute pericoronitis involves many intense symptoms like fever, swelling, and pain. These symptoms may indicate the spread of the infection. The partial eruption of the wisdom tooth allows for an opening for bacteria to enter around the tooth and for food particles to get stuck. Because of the entrapment of debris in the space between the tooth and the overlapping gum flap, the operculum, bacteria builds up. Thus, this can lead to the formation of an abscess under the operculum or operculitis. Unfortuantely, the infection can expand to other soft tissues, irritate the gums, and eventually lead to pericoronitis without treatment. When pericoronitis becomes severe, the inflammation can reach the jaw, cheeks, and the neck. What increases the likelihood of pericoronitis? Because the condition usually affects the wisdom teeth, people in their mid-20s who are likely to develop their wisdom tooth are more susceptible. Also, the presence of excess gingival tissue overlapping the wisdom tooth heightens the risk of pericoronitis. Wisdom teeth, which are located at the back of the mouth, are also difficult to reach. In turn, this makes proper cleaning challenging. Because of this predicament, the area can be more vulnerable to bacteria that can infect the partially-erupted tooth and the overlying gums. What are the signs and symptoms of pericoronitis? Pain that can radiate to other parts of the oral cavity like the ear, throat, floor of the mouth, the temporomandibular joint or TMJ, and the posterior submandibular region. As the condition worsens, the pain can become severe, disturbing sleep and making it difficult to chew. A dentist can diagnose the dental condition through the occurrence of symptoms and clinical evaluation. A dental X-ray can help determine the position of the wisdom tooth and potentially the severity of pericoronitis. Other causes of pain and inflammation must be ruled out before making a pericoronitis diagnosis. Any licensed dentist is qualified to treat pericoronitis. However, an oral surgeon may be necessary when the condition requires surgery. For severe, complex cases, a gum specialist or periodontist may be best to provide treatment. Treatment of pericoronitis includes pain and inflammation management, surgery, and wisdom tooth extraction. When symptoms of pericoronitis are present, visit your dentist immediately for the proper diagnosis. As a result, your dentist can prescribe antibiotics and/or pain killers. But if the pain and inflammation become intense, undergoing oral surgery may be your most reliable option to remove the gum flap. Removing the gum flap allows a dental professional access to the area and to properly clean it of bacteria build-up and food particles. However, the gum tissue may grow back and reignite the same condition. Additionally, another option and the most common is wisdom tooth extraction. Because wisdom teeth are often poorly positioned or do not erupt entirely, many individuals opt to get them removed. It is also recommended to extract an impacted wisdom tooth to prevent pericoronitis. Severe symptoms of pericoronitis can call for dental emergency. This is especially true when the pericoronal abscess is rapidly spreading, and the lymph nodes are swelling. We at Hawaii Family Dental welcome patients for dental emergencies. Our emergency dentist will relieve you from pain and save you from worsening conditions that may call for more extensive and expensive dental procedures. What home remedies can you do for pericoronitis? Proper oral hygiene remains to be the best home remedy you can do for mild indications of pericoronitis. Thoroughly and gently brush your teeth to remove plaque and food. Additionally, you can use oral water irrigators to clear out particles and bacteria beneath the operculum. To soothe inflammation, you can rinse with warm salt water or diluted hydrogen peroxide to reduce the bacteria. However, when symptoms are severe, seek proper care from the right healthcare professionals. What is the prognosis for pericoronitis? With proper care and treatment, pericoronitis can be managed or treated. Depending on the severity, the dental condition can last for days or weeks. However, it typically resolves in about a week or two with treatment. It is recommended to address symptoms as early as possible to avoid complications from occurring like Ludwig’s angina and sepsis which are life-threatening. How can pericoronitis be prevented? Like most dental problems, pericoronitis is something we can prevent. We recommend conscientious oral hygiene like brushing, flossing, and rinsing with mouthwash. This can help prevent the accumulation of bacteria and the lingering of food particles that can lead to an infection. We also suggest visiting the dentist at least twice a year to help identify dental problems early before they worsen. Your dentist can check the development of your wisdom teeth and determine the need for extraction.